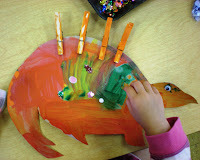 Preschool Playbook: Volcanoes, Dinos, and Nests...Oh My! We did just about everything today. I thought it was going to be a slower day. Did I even look at my plans? I really have to thank Mrs. S immensely. She is pretty busy, no breathing time this week. So, what was my big plan? A dinosaur nest! I thought this was a pretty good idea, if I do say so myself. 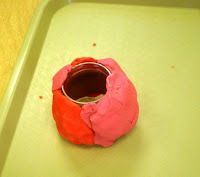 Yesterday we talked about how a dinosaur might make a nest for its eggs. The children thought they might dig a hole, but we didn't have an area to do that. 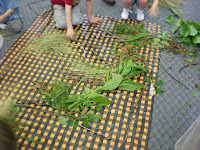 We also thought they might use sticks, leaves, mud, grass, or rocks. We steered away from the rocks. 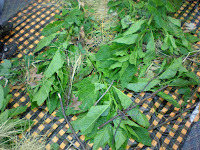 I asked the children's parents to help them collect some items and bring them to school today. 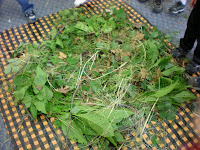 We put everything in a big container, laid out a tablecloth, then built our nest. I stood back and took pictures as the children put it together. I thought it turned out pretty neat. 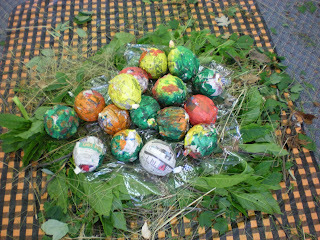 We then added our eggs to the nest. 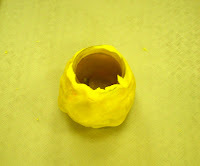 (If you look closely I laid some plastic wrap in the nest to put our eggs on. We are having quite a bit of rain here.) 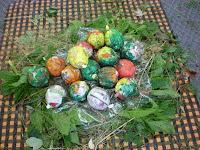 Tomorrow we hope our dinosaur eggs will hatch. 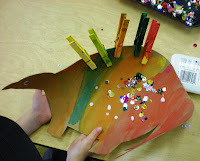 We finished up our Stegosaurus by clipping the clothespins on and adding some scales. 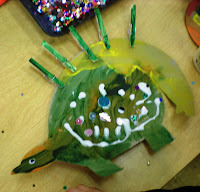 I let the children decide how many "plates" they wanted for their dinosaur so there is a different amount on each one. 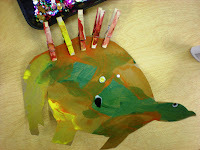 I then let them add some "scales" if they wanted, (sequins). These will go home tomorrow--lots of glue. 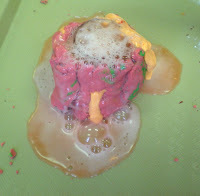 Now it was time for making some erupting volcanoes. I found this activity on many different sites and a big thanks goes out to all. This activity was a little hectic, and pretty quick. For the 16 children I split them into four groups and had one volcano per group. 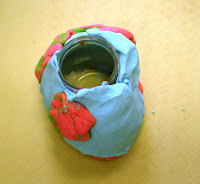 Each group got a baby food jar on a tray and some play dough. 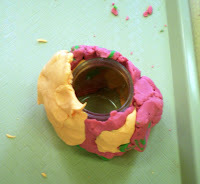 They wrapped the dough around the jar to make a volcano. 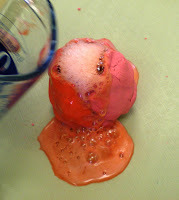 I then had one child add some baking soda, one child added red food coloring, one child poured vinegar in the measuring cup, and one child poured the vinegar in the jar. KABOOM--not quite that loudly, but you get the idea. After snack I had about 15 minutes left so I read a short book before it was time to pack up. 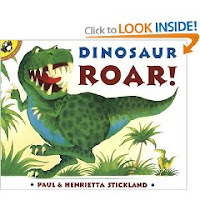 The book today was "Dinosaur Roar!," by Paul and Henrietta Stickland. This is a fun book of opposites. It is also a very popular book. They kept telling me they had read it before, so I said I would read the one side, and they could "read" the other. One more day and our adventure is done. What can we possibly do tomorrow? Those eggs look SOOOOOOOOOOOOOOOOO cool especially on the nest! So um... are the eggs going to hatch? How fun! The nest turned out really cool and I love both volcanoes. 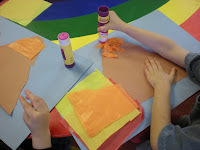 I am so glad I stumbled across your blog, it is really helpful with providing ideas to do with my day care children. 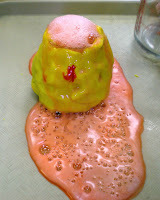 I have tried the volcano experiment a few years ago with my son, he was fascinated as all children are. 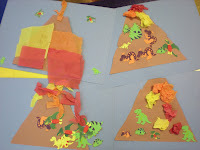 I agree that the dinosaur eggs in the nest is a great idea, so is the volcano and dinosaur making. I look forward to trying out some of these soon. My girls have been wanting to do the volcano! Great activities, Trish.